Eindhoven / Maastricht – The Maastricht University Medical Center+ (Maastricht UMC+) has carried out research in partnership with Philips to investigate the effect of light on the sleep-wake rhythm of cardiac patients. The research shows that after seven days in a patient room fitted with HealWell ─ a new lighting system developed by Philips which mimics the natural day/night cycle outdoors ─ patients sleep on average 8% longer. After one week in a patient room fitted with standard lighting, on the other hand, patients&apos; sleep duration was in fact slightly shorter than on the first night. Existing scientific research has shown that high levels of light during the day help to regulate the human biological clock and the sleep-wake rhythm. If a person&apos;s biorhythm is less than optimum, this can disrupt sleep and give rise to all manner of health problems. Philips HealWell combines the positive biological effects of natural daylight with a pleasant atmosphere in the patient room. This has a positive effect on the patient&apos;s sleep patterns and that in turn has a positive effect on their biorhythm, which is important for their health and well-being. HealWell also enables patients to create a pleasant atmosphere from the comfort of their hospital bed and enables caregivers to create optimum light in which to work. The research has demonstrated some significant improvements: the time it takes a patient to fall asleep is reduced by approximately 30% during the period between the first and the seventh night and at the same time the duration of sleep at night increases by on average 8%. This means that a patient sleeps on average 30 minutes longer. The research also shows that patients really appreciate being able to select the ambient lighting themselves. The healthcare personnel are also very impressed with the Philips HealWell lighting, partly because of the better light distribution over the entire bed without any annoying shadows. The Maastricht UMC+, the Clinical Trial Center Maastricht and the University of Maastricht have spent over nine months carrying out research into the effects of the Philips HealWell system on sleep and well-being among patients. This dynamic lighting system was installed in a number of patients’ rooms in the hospital&apos;s Cardiology department. Over 100 cardiac patients took part in the survey, whereby one group was treated in patients rooms fitted with the Philips HealWell system and the other group, the control group, was treated in patient rooms equipped with standard lighting. It is still too early to make clinical claims of the healing effects of HealWell, but the field study has shown positive, very encouraging results. 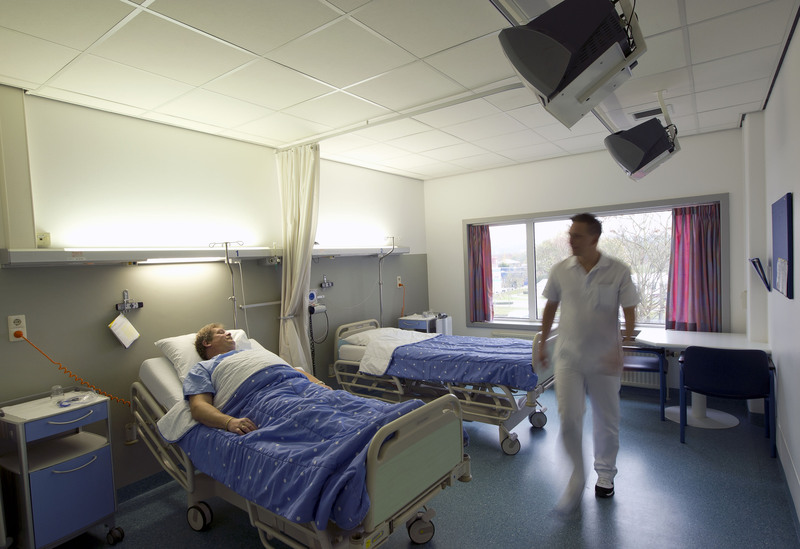 Philips HealWell is a lighting system that is installed in a hospital patient room. HealWell produces lighting levels that change gradually throughout the course of the day, much like the changes in light outdoors on a sunny day, and this affects sleep and mood. It is becoming increasingly important for healthcare institutes to create a healing environment in order to make the patients&apos; stay more enjoyable and to promote their recovery. The university hospital Maastricht (azM) and the Faculty of Health, Medicine and Life Sciences (FHML) of the Maastricht University (UM) joined forces in January 2008 in the eighth university medical centre in the Netherlands. The new organization is called Maastricht University Medical Center+ (Maastricht UMC+). The main tasks of the Maastricht UMC+ are patient care, education and research, all of which are closely interrelated. In addition to standard patient care, top referral care and advanced clinical care play an important role at the Maastricht UMC+. Advanced clinical care and top referral care require fine-tuning and close cooperation with the fundamental research and (experimental) clinical research. Key research areas are cardiovascular diseases, oncology, chronic diseases and mental health care and neurosciences. In addition to treatment and care, health and the prevention and prediction of diseases is becoming evermore important. The development of demand-driven care has led to the establishment of ‘integrated care’, which gives direction to research and education. creating centers of excellence on the key research areas. The Maastricht UMC+ is located in the centre of the Euregion Meuse-Rhine. University medical centers in Liège and Aachen lie within a range of just thirty kilometres. Intensifying collaboration in the Euregion is one of the main goals of the Maastricht UMC+. The Maastricht UMC+ ( www.summum.mumc.nl, www.azm.nl and www.unimaas.nl/fhml ) has 715 hospital beds, over 6.100 employees and about 4.000 students. The Maastricht UMC+ is part of the Dutch Federation of University Medical Centers, ( NFU, www.nfu.nl ). The NFU is a cooperative venture involving the eight university medical centers (UMCs) in the Netherlands, with the primary aim of promoting the UMCs’ common interests.